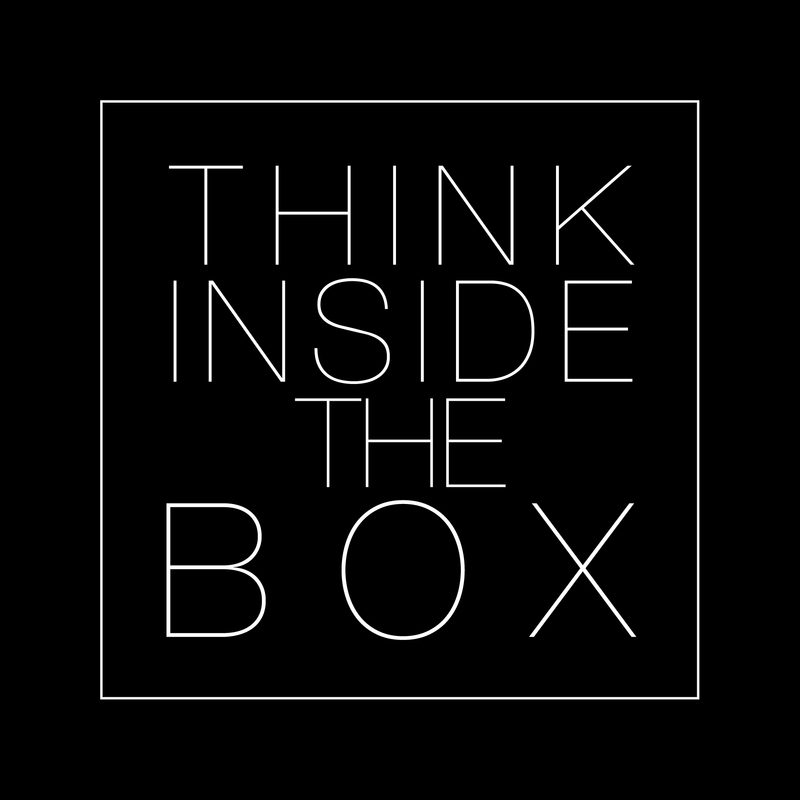 You’ve all heard about “thinking outside the box.” It’s a tired expression really. “You need to put on your innovation hat! You need to think outside the box!” OK, true enough I guess. But actually, we live in a real world with real constraints. We are, truth be told, in a box. There are timelines, there is physical space, there are responsibilities, there are budgets. Yes, we can solve problems with new ideas that are transformative. But arriving at those ideas, the pathway to uncovering those ideas isn’t as straightforward as people seem to imply. If it was, many more people would be SteveJobsian. But Mr. Jobs was a special case indeed. He had the money, the space, the authority, to step outside the box and create a pristine environment where he had tons of white space to invent the future. It was the same with Bill Gates and his famous Think Weeks. For most of us though, our jobs come with a big list of minimums. Track your time, file your expenses, answer email, buy lunch for the team, manage up, manage down, write this report, develop this point of view, complete this budget. That’s what you get paid for. To deliver. That’s your box. And it takes 9, 10, 11 hours a day including time before and after the work day and on weekends. Find some whitespace. Maybe you can’t break away for a two day retreat. But you can block out two hours and disconnect. It’s important to do both. As John Cleese points out, it takes a half hour just to get in the right rhythm. Work at it. No, I mean really work at it. Stick to it. Dig. There’s a false platitude out there that says these ideas just switch on like light bulbs. That’s rarely the case. Mostly it takes persistent, perpetual, habitual, pushing, pulling, digging, uncovering, connecting, abandoning, retrying. Sometimes, if you’re not getting anywhere, keep going. It might mean you’re almost there. Great ideas sometimes come into view slowly. Be visual. It’s not all about words. It’s not all about listing thoughts on a whiteboard. It’s not. We are all visual people. Draw. Doodle. Make crazy diagrams and connections. Print out pictures and put them on your walls. Use Pinterest to collect visual cues to the ideas you resonate with. Inspire yourself and others with art! Sometimes, adding beauty, adding the visual element, is the only way a brilliant idea gets a heartbeat. Listen. Don’t interrupt. Just don’t do it. Let people talk, pontificate, get out all of their thoughts. Then, ask one simple question. And listen some more. Your team is full of ideas. But ideas follow a journey in real time. Those ideas can be developed and created in real time. But only if you give them room to breath. Create a culture in the room of letting people work out their thoughts live, in real time. Read. Yes, read. As Joseph Addison so aptly put it, “Reading is to the mind what exercise is to the body.” Aldous Huxley said, “Every man who knows how to read has it in his power to magnify himself, to multiply the ways in which he exists, to make his life full, significant, and interesting.” If you don’t read, you really can’t innovate. Simple as that. Make sure some of the space in your box contains a library. You don’t have to read every book either. Skimming books provides innumerable inspiration. It’s true that one of the constraints of the box is time. It’s tough to find time to read a 300 page tome. So skim. Underline. Pick out relevant chapters right out of the middle of the book. Self Talk. Try your ideas out verbally in private. All by yourself. Out loud. You need to let them flow out of you. You need to hear yourself present them, try out different formats, different patterns, let your hearing mind be your own critic and creator. Maybe it’s in the shower, maybe it’s while driving, maybe you take a walk. But put your ideas out there in verbal form and see what they look like. You’ll be amazed when it comes time to present them how much cleaner and more organized and articulate you’ll be. Connect. This one’s easy but so often avoided. Find like-minded people and fuel each other’s thoughts. 1+1 = 3 in this case. It is true that many people will be pessimists and randomists (that is, they feel the future is merely random luck). Avoid them. Can you put a dent in the universe? Yes you can. Connect with other future sculptors and start chipping away. Small chips over days, weeks and months turn into your David. Diverge. Get outside your scope. It’s a very uniform world indeed. Beethoven, Matisse, Chihuly, Musk, Gladwell, you, me. In many ways we’re all working on the same things. How can we create something of value, for our families, for ourselves, for our companies, for society? Find as many masters as you can outside your specific discipline and get to know their paths. Translate. From history. Not so much your own history. The history of innovation, invention, creativity. How has it been done in the past? Steam engine (Watt), automobile (Ford), energy company (Edison). Same planet, same human characteristics, different mediums, different technology. Translate. Go. Persistence. Duh. This should really be #1. The world will tempt you to give up, to accept that the box you’re in just doesn’t allow for breakthrough ideas, successes. It’s not true. But the number one reason why isn’t the world or the box. It’s us. It’s that we stop when we’re right on the doorstep of that breakthrough. Keep. Going. You live within constraints. To acknowledge that in a real way is the way forward. But to stretch those constraints, to speak out the future in terms of possibility, this is the path to innovation. As TR would say “Whenever you are asked if you can do a job, tell ’em, ‘Certainly I can!’ Then get busy and find out how to do it.” Go for it. This entry was posted in History, Innovation, Leadership, Opportunity, Vision and tagged Creativity, Execution, Fundamentals, Growth, Henry Ford, Innovation, Inspiration, Leadership, Productivity, R&D, Thomas Edison, Vision. Bookmark the permalink.